Yey!!! It's TOYCON day today and probably everyone is so excited to go out and experience the fun of this annual event and gathering of geeks, fanboys and hobbyists. But wait! Are you really ready to step out that door? Do you really know what kind of event are you going to? Do you really think you are prepared for TOYCON PH? 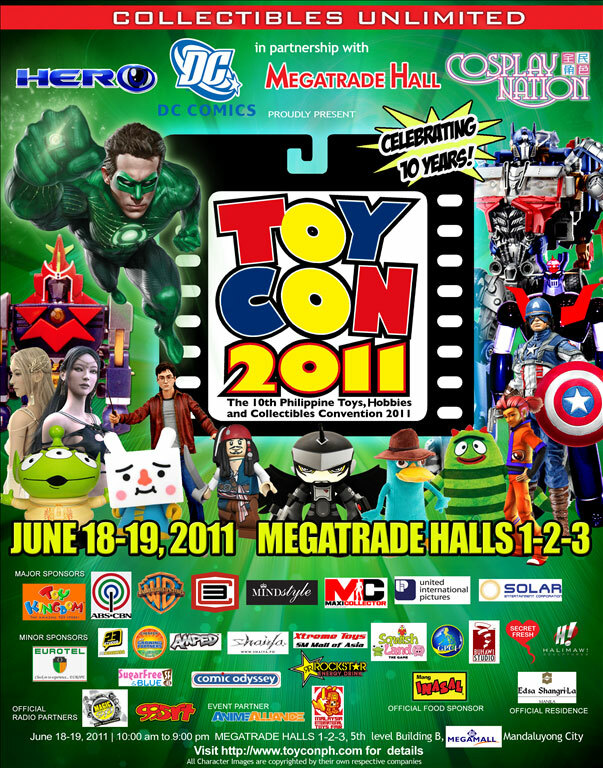 If not then here are some tips for you to follow for a very smooth TOYCON experience. 1. Save Money. This is suppose to be a pre TOYCON preparation but then again just in case on the next TOYCON, you may at least consider saving money 2 weeks before the event, specially to those who are still unemployed. It is definitely better than asking your mom and dad to give you money to buy that Naruto plush. Save money from your "baon" and make your parents proud of your saving habits. 2. Have a companion. The event may become boring at some moments and when that happens, it pays that you have somebody to talk to. The convention is really a riot. I assure you, you need somebody to maintain sanity level at good condition before you start talking to to inanimate objects like those who are being sold on the toy booths. 3. Make a list of items you want to buy. This is to lessen the travel time on booths. The hall will be jam-packed with other attendees so it is really a big hassle to just go back on booths that you already visited. It will eventually help you conserve your energy so that you will not get easily tired. 4. Eat before going to the event. Load yourself up so that you won't need to eat that much. Other than saving money for food it is also hassle to eat on nearby fast foods because obviously they are also packed with people from the convention + mall shoppers. 5. Charge your gadgets. I know everyone likes taking photos and videos of the event. So I think this tip is already self explanatory. Charge your cameras, phones, video cam and other gadgets to avoid unintended battery depletion. 6. Make sure your phone is loaded. You lost your friend in the crowd. You will now text him to ask where he is. But when you finally pushed the send button you only got a message that says: "Message not Sent". Load your prepaid phone. You'll never know when you will need to contact somebody specially on emergency situations. 7. Wear comfortable clothes. Seriously, forget being so "maporma" on this occasion. The event is full of people and even that the mall has a centralized air conditioning, there is a moment that it will become scorching hot inside the hall. Ok I'm exaggerating, maybe not scorching but still hot. As in you will experience one of the worst days of your life. And because of that, I'm advising everyone attending the event that you wear something comfortable. T-shirts and cargo shorts are highly advisable. As much as possible don't wear layers of clothes and long pants. And if you can, wear sandals instead of shoes. 8. Watch your back. Just like anywhere, TOYCON can be also infiltrated by thieves, con artists and scammers. I advise everyone not to easily trust people that you don't know and be vigilant on protecting your things to prevent them from getting stolen. 9. Lessen your baggage. Don't hassle yourself with things you won't really need on this event. More baggage means more weight. More weight on your load will just tire you easily and it is much harder to guard against thieves. 10. Know the authorities. When everything fails all you need to know is ask. And the best people to ask questions about TOYCON are the organizers and other member of the production team. They are not really hard to find and in fact you can easily spot them because usually they wear IDs and they spend most of the time near the stage or the technical booth. I know there are more tips out there that can be very useful for TOYCON attendees. Tips on this list are just some of the very important advise that I can share base on my own experience as a TOYCON patron. I hope this guide is useful for everyone and see you all at the event.